I've been doing a little reading to put the recent Nowak et al. paper in context, and I came across another interesting recent critique of kin selection and its limitations. This is a fascinating area of study, and the fact that theoretical arguments have continued so long since the introduction of the inclusive fitness concept tells me that it is perplexing even for experts. 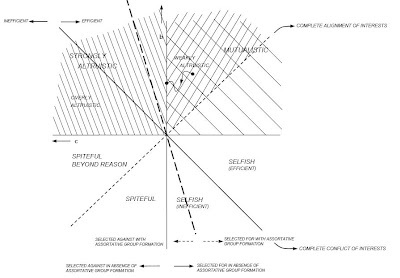 In the interest of clearness, here is Figure 1 from the paper, which gives a nice graphical representation of the cost-benefit relationship. In this figure: "c the net cost of the behaviour to the acting individual, and b the aggregated benefits to the others." I'll keep on thinking about both papers before I write anything more on the subject. The latitudinal/longitudinal error for leave-one out validation is shown on the left. This involves using N-1 out of N samples to build an estimator, and then guessing the longitude/latitude of the Nth sample that was not included in the estimator. The authors make a point that latitudinal error is smaller than longitudinal error. However, we should keep in mind that the "rectangle" of the sampled populations (east-west limits: Portugal-Serbia) does not approach a "square", so the relative error (absolute longitudinal error/longitudinal extent) is not that different. 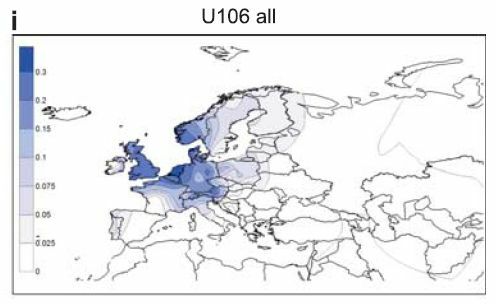 Recent large-scale studies of European populations have demonstrated the existence of population genetic structure within Europe and the potential to accurately infer individual ancestry when information from hundreds of thousands of genetic markers is used. In fact, when genomewide genetic variation of European populations is projected down to a two-dimensional Principal Components Analysis plot, a surprising correlation with actual geographic coordinates of self-reported ancestry has been reported. This substructure can hamper the search of susceptibility genes for common complex disorders leading to spurious correlations. The identification of genetic markers that can correct for population stratification becomes therefore of paramount importance. Analyzing 1,200 individuals from 11 populations genotyped for more than 500,000 SNPs (Population Reference Sample), we present a systematic exploration of the extent to which geographic coordinates of origin within Europe can be predicted, with small panels of SNPs. Markers are selected to correlate with the top principal components of the dataset, as we have previously demonstrated. Performing thorough cross-validation experiments we show that it is indeed possible to predict individual ancestry within Europe down to a few hundred kilometers from actual individual origin, using information from carefully selected panels of 500 or 1,000 SNPs. Furthermore, we show that these panels can be used to correctly assign the HapMap Phase 3 European populations to their geographic origin. The SNPs that we propose can prove extremely useful in a variety of different settings, such as stratification correction or genetic ancestry testing, and the study of the history of European populations. That means that those of us of non-African ancestry are all equally distant from the African root. The tree makes it clear: all non-Africans form their own independent branch from Africans. In the PCA you see that along the biggest component of variation in the genetic data the non-African groups are about the same distance from Africans. And in the ADMIXTURE analysis when you assume four ancestral populations, the Africans and non-Africans separate out cleanly excluding groups which a high likelihood of European or Arab admixture. Neither PCA nor ADMIXTURE tells us anything about who is more distant from Africans. 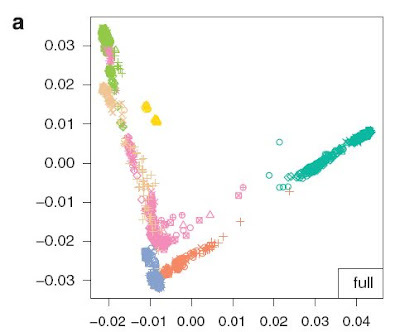 First of all, the clusters identified by ADMIXTURE are not phylogenetic units, nor is the pattern of splits at successive K evidence for the human phylogeny. 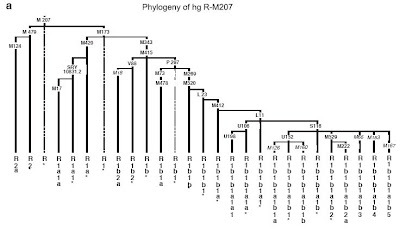 For example, at K=2, East Eurasians split from Europeans/Africans, even though it is clear that East Eurasians do not represent a sister clade to a clade comprising of Europeans/Africans. In short ADMIXTURE (a well as frappe, STRUCTURE and assorted Bayesian clustering methods) tell us nothing about who is more distant from whom. Nor does PCA tell us anything more. Sure at the first 2 dimensions, Africans split off from non-Africans but that is insufficient to conclude that Africans are equidistant to all Eurasians. This is due to the fact that distance at the first two dimensions of PCA lower bounds total distance (a consequence of the Pythagorean theorem, no less). What does this mean? Populations that are equidistant on the (PC1, PC2) plane may be actually non-equidistant overall. Finally, the tree argument provides evidence for Out of Africa, but it does not provide evidence for equidistance, as it not only encodes phylogenetic relationships (who is closer to whom in evolutionary terms) but also distance. It is perfectly possible that two taxa A and B may form a clade relative to a third taxon C, but that does not guarantee that A will be closer to B than to C.
Note that Yoruba (YRI) are most distant from Amerindians (AI), while all other populations fall within a very narrow range of 0.101197 to 0.119501 or about ~18% variation in distance to Yoruba. Things become more interesting if we exclude Caucasoids (CEU) and limit ourselves to East Eurasians. Now, the range of distance from Yoruba becomes 0.108875-0.119501, or only ~10% variation in distance to Yoruba. "Drift" gets invoked so often, so it is worthy to consider if it is responsible for the greater distance of Amerindians to Africans. "Drift" can indeed shift allele frequencies in a small population, and increase Fst. However, there are dozens of small and isolated populations throughout Eurasia, yet none of them are more distant from Africans than Amerindians are. If "drift" is responsible, then we would expect some isolated Eurasians to repeat the pattern of greater distance that Amerindians present. Good luck finding any study where any Eurasian population is more distant to Africans than (unadmixed) Amerindians are. There is no need to invoke "drift" to explain Amerindian-African distance, as there is a simpler explanation: Amerindians, unlike Eurasians, are more distant from Africans, not because of "drift" shifting their allele frequencies, but because they lacked the opportunity for substantial gene flow with Africans. It is worthy to revisit the Fst table: Amerindians are 1/5 further from Africans than East Asians are because they spent about 1/5 of the time since "Out of Africa" isolated from Africans. East Asians had about 60 thousand years worth of opportunities for gene flow with Africans (however limited), while the corresponding time for Amerindians is about 45-50 thousand years. (*) The direction of this gene flow is contested as both Eurasian and African origin of YAP have been proposed. That's not important however, as YAP links Africa and Eurasia at the exclusion of the Americas either way. UPDATE (Dec 24): It turns out that the greatest distance within our species is between Mbuti Pygmies and Papuans. Cyran said human genetic models have become more complex over the past couple of decades as theorists have tried to correct for invalid assumptions. But some of the corrections -- like adding branching processes that attempt to capture the dynamics of population growth in early human migrations -- are extremely complex. Which raises the question of whether less complex models might do equally well in capturing what's occurring. "We wanted to see how sensitive the estimates were to the assumptions of the models," Kimmel said. "We found that all of the models that accounted for random population size -- such as different branching processes -- gave similar estimates. This is reassuring, because it shows that refining the assumptions of the model, beyond a certain point, may not be that important in the big picture." Methods of calculating the distributions of the time to coalescence depend on the underlying model of population demography. In particular, the models assuming deterministic evolution of population size may not be applicable to populations evolving stochastically. Therefore the study of coalescence models involving stochastic demography is important for applications. One interesting approach which includes stochasticity is the O’Connell limit theory of genealogy in branching processes. Our paper explores how many generations are needed for the limiting distributions of O’Connell to become adequate approximations of exact distributions. We perform extensive simulations of slightly supercritical branching processes and compare the results to the O’Connell limits. Coalescent computations under the Wright–Fisher model are compared with limiting O’Connell results and with full genealogy-based predictions. These results are used to estimate the age of the so-called mitochondrial Eve, i.e., the root of the mitochondrial polymorphisms of the modern humans based on the DNA from humans and Neanderthal fossils. In a past post I had noted that the occurrence of low-frequency divergent haplotypes in a population might be a "relic of a bygone age". The point I was trying to make is that early settlement in a region may create a diverse gene pool (as there is plenty of time for variation to accumulate), but this antiquity of settlement may be obscured by later (including fairly recent) expansions of sublineages that appear to be young in evolutionary terms. Hence, the importance of outliers in age estimation, as these may alternatively be "relics" of the most ancient population (prior to the expansion, due to either selection or demographic increase, of the recent lineages), or introgressed lineages from abroad. 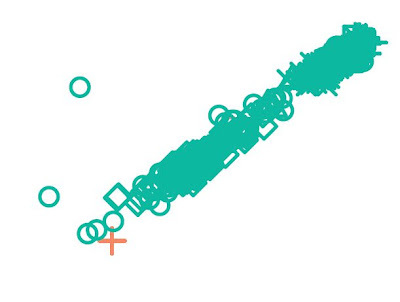 In order to discover outliers, you need a large sample. 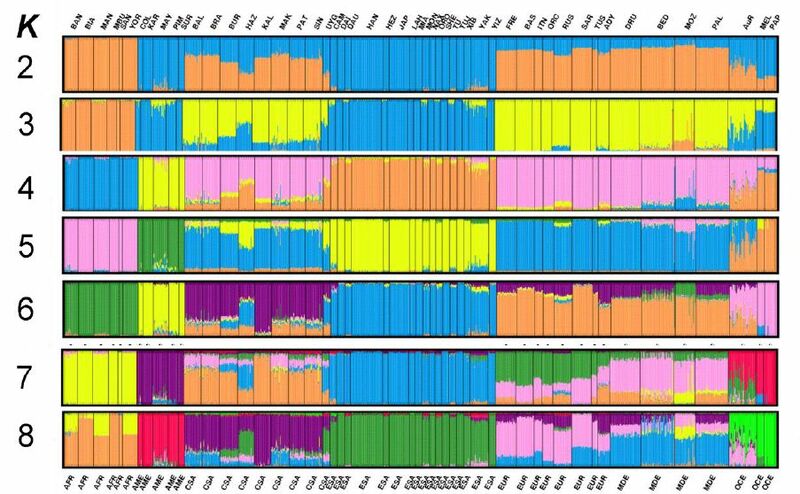 The authors of this paper, in the context of mtDNA, discovered 5 new basal (=near the trunk) lineages within Eurasian macrohaplogroups M and N. This is less than 0.1% of their huge Chinese sample. In a smaller sample, as is customary in most mtDNA studies, these outliers would probably have been undetected. What is most interesting, is that the authors explicitly tried to distinguish between the two competing hypotheses described above: admixture and "relics". The new lineages do not appear to be the result of foreign admixture (e.g., some rare Indian M subclade that somehow found itself into southern China), but to be true relics. The existence of relics pushes back the time of settlement/Out of Africa expansion, as more time is needed to "tie in" the relics with the rest of the tree. 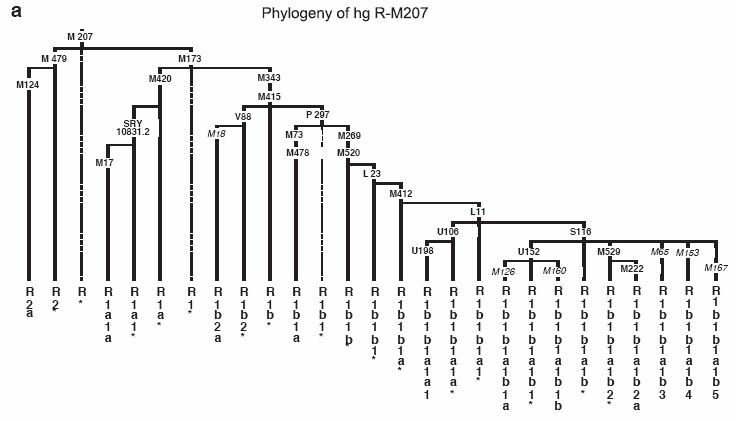 This should serve as a warning for age estimation: so many times, peculiar lineages are brushed aside with a paragroup label as oddities, while researchers focus on the more established and phylogeographically informative lineages. While full-mtDNA sequencing is a viable option, the same procedure is not widely-applied in Y chromosomes, as the Y chromosome is much larger than mtDNA, and hence more difficult (and expensive) to fully sequence. A 6,000-strong sample is probably not available for most countries and populations, except for the Genographic project -which seems to be missing in action of late. There are also large commercial samples which benefit from the desire of paying customers with unusual haplotypes to look deeper into their ancestry. Unfortunately these same customers are WEIRD, and give us little information about most of mankind, including about the most interesting and mysterious aspects of human prehistory. Nonetheless, there is hope for the future, as sample sizes continue to increase and genotyping costs to decrease. While there is reason to share Craig Venter's bleak assessment of the accomplishment of genomics, the single, clear, field where human genetics has triumphed and will continue to triumph is that of human origins. UPDATE: Gene Expression notes that commercial companies like 23andMe have even larger samples, and customers can download 550k SNPs for their sample. However, most of the people who buy 23andMe tests are -in the global context- near clones of each other, being predominantly of western European origin. Moreover, the thousands of SNPs included in the technology used by 23andMe include a limited number of mtDNA and Y chromosome SNPs which have been chosen for their informativeness, i.e., they define studies clades of the phylogeny, and are thus unsuitable for discovering new clades -as was done in this paper. I'm pretty sure there are paragroups a-plenty in both the 23andMe customer base or in the Genographic Project, but, as far as I know neither of the two aggressively mine their data for SNP discovery/phylogeny refinement, and there are ethical limitations to consider, as people who sign up for either service do not, necessarily approve of their DNA sample being used beyong the narrow scope of the provided service. In order to achieve a thorough coverage of the basal lineages in the Chinese matrilineal pool, we have sequenced the mitochondrial DNA (mtDNA) control region and partial coding-region segments of 6,093 mtDNAs sampled from 84 populations across China. By comparing with the available complete mtDNA sequences, 194 of those mtDNAs could not be firmly assigned into the available haplogroups. Completely sequencing 51 representatives selected from these unclassified mtDNAs identified a number of novel lineages, including five novel basal haplogroups that directly emanate from the Eurasian founder nodes (M and N). No matrilineal contribution from the archaic hominid was observed. Subsequent analyses suggested that these newly identified basal lineages likely represent the genetic relics of modern humans initially peopling East Asia, instead of being the results of gene flow from the neighboring regions. The observation that most of the newly recognized mtDNA lineages have already differentiated and show the highest genetic diversity in southern China provided additional evidence in support of the Southern-Route peopling hypothesis of East Asians. Specifically, the enrichment of most of the basal lineages in southern China and their rather ancient ages in Late Pleistocene further suggested that this region was likely the genetic reservoir of modern humans after they entered East Asia. The low incidence of E-M293 (0.8%) and A-M91 (0%) on the Comoros contrasts strongly with the frequency of these haplogroups in East African populations. This is an interesting piece of evidence in support of the idea of very recent genetic changes in east Africa. A comparison of the relative incidences of E-M78(V22), E-M123, G, J, L, Q and R on the Comoros with populations around the Arabian Sea shows greatest similarities with Southern Iran, and, to a lesser extent, Turkey. A possible source of the Northern Y-chromosomes is therefore the Shirazi traders from Southern Iran who established trading posts on the Comoros by 800YBP. I have often noted that what you don't find in a population is often more informative about ancient history than what you do find, as it points towards -in the absence of a very small founding population- to its absence in the source populations. In the case of the Comoros, I note the absence of the R1b clade, which ties these islands with India and parts of the Middle East as the only R1b-less regions influenced by Caucasoids. A trace of E-M78, in the form of E-V22 (0.5%) is also interesting, and certainly ties the Comoros with the interior of the Middle East where E-M78 is rare, rather than the more western regions where it is frequent. Feel free to leave a comment if you figure out something extra about these chromosomes. There were also C* and K* lineages on the islands, which could also plausibly be SEA in origin. However note that these are C*(xC1-5) and K*(xLMNOPQRST). The Comoros Islands are situated off the coast of East Africa, at the northern entrance of the channel of Mozambique. Contemporary Comoros society displays linguistic, cultural and religious features that are indicators of interactions between African, Middle Eastern and Southeast Asian (SEA) populations. Influences came from the north, brought by the Arab and Persian traders whose maritime routes extended to Madagascar by 700–900 AD. Influences also came from the Far East, with the long-distance colonisation by Austronesian seafarers that reached Madagascar 1500 years ago. Indeed, strong genetic evidence for a SEA, but not a Middle Eastern, contribution has been found on Madagascar, but no genetic trace of either migration has been shown to exist in mainland Africa. Studying genetic diversity on the Comoros Islands could therefore provide new insights into human movement in the Indian Ocean. Here, we describe Y chromosomal and mitochondrial genetic variation in 577 Comorian islanders. We have defined 28 Y chromosomal and 9 mitochondrial lineages. We show the Comoros population to be a genetic mosaic, the result of tripartite gene flow from Africa, the Middle East and Southeast Asia. A distinctive profile of African haplogroups, shared with Madagascar, may be characteristic of coastal sub-Saharan East Africa. Finally, the absence of any maternal contribution from Western Eurasia strongly implicates male-dominated trade and religion as the drivers of gene flow from the North. The Comoros provides a first view of the genetic makeup of coastal East Africa.